Mark’s paintings are inspired by the intensely personal and introspective journey of life and it’s ever changing complexities. 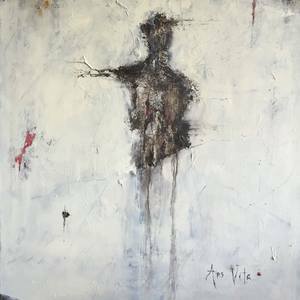 Mark describes his work as, "Absence and Presence” capturing the physical mixed with spirituality on canvas. A chemistry of lyrical abstraction with frenzied marks, many of which previously lay hidden, buried beneath strong layers of self-taught expression. Mark’s paintings aim is to engage a dialog with the spiritual and allowing the viewer to explore their own interpretation. He seeks to evoke a feeling rather than depict a defined image. His process includes continuously building up and tearing down, adding and subtracting. He uses primarily oils and encaustics to create thickly layered canvases. A visceral dance between the conscious and the unconscious until the emotion is expressed. His influences range from Alberto Giocametti, Anselm Keifer and Cy Twombley. His works are collected by many private and corporate collectors around the world, including Hong Kong, Japan, Dubia, Europe and the United Sates.